Wonderland Adventures: Mysteries of Fire Island Game - Download and Play Free Version! Mystery and Danger Abound in Wonderland! Wonderland is in trouble again-this time, fireballs are raining from the sky! But there is more to this than meets the eye. Can you discover the mysteries of Fire Island and save everyone? Help the adorable, round Stinkers venture into the unknown to save Wonderland in this continuation of the Wonderland games. An Adventure Game for All Ages! This unique, puzzle-solving adventure game is great for all ages! With a little help from a wizard, it's up to you to explore Fire Island and solve various mind-bending puzzles in order to figure out how to save Wonderland. 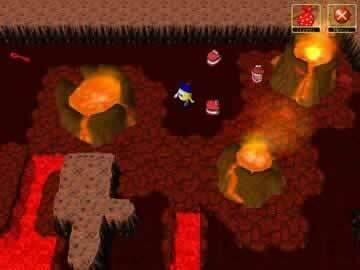 Point and click to move your little round character and find puzzles in amazing environments ranging from bustling towns to beautiful caves. 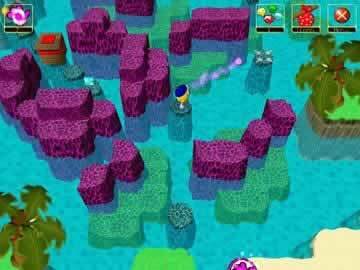 You'll face more than 100 adventures including puzzles to step on the correct colored plate to open gates, rotating bridges to get to the correct ledge and using inventory items to open new parts of the island. Learn to Solve Fun Puzzles! 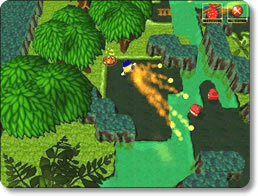 Gamers of all ages will enjoy interacting with the cute characters and nicely-illustrated landscape. The unique puzzles give gamers a breath of fresh air. It's easy to fall in love with Wonderland and its adorable inhabitants as you stretch your creativity to develop strategies to save Wonderland. A charming world of mystery and fun needs your help! Can you solve all the puzzles and save Wonderland in this epic adventure? Check out some of the puzzle solving fun you can experience as you uncover the mysteries to be found on Fire Island.